Jugurthine War (112-105 B.C.) 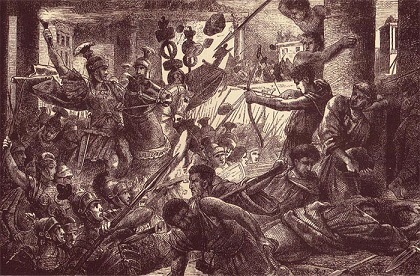 - A war in North Africa between Rome and Numidia. It takes its name from the man, Jugurtha, who tried to rule Numidia after the death of his father. His ambitions led to a civil war in which Rome eventually intervened. The Numidian kingdom was a rising power in the region after the Fall of Carthage in 146 B.C.. With its own power increasing, Rome found itself meddling in the affairs of foreign nations more and more. The most lasting legacy of the Jugurthine War was the rise of generals Marius and Sulla who foreshadowed Pompey and Caesar.